A breakout year for the company, Miami-based BLU left its mark in the mobile space throughout 2015, but 'it's wasting no time in directing its momentum. 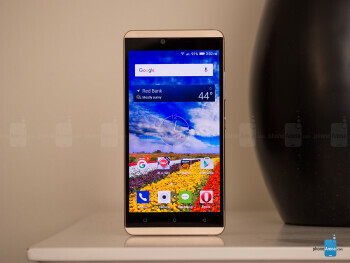 In fact, it announced not one, but two new affordably priced smartphones that don't sacrifice in style during CES 2016. We're checking out the cheaper of the two, the BLU Vivo XL, which chimes in with a devilishly hard-to-resist starting price of $149.00. 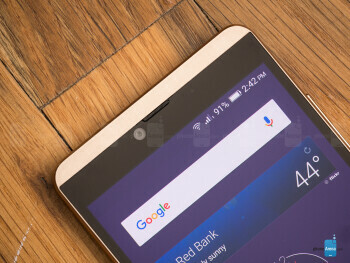 Visually appealing from head-to-toe, it's undeniably fabulous that its design is a central focus, but let's cross our fingers that other aspects of the _phone_ aren't compromised. If this is what we can expect from a sub-$150 phone, we have higher expectations from the competition. BLU doesn't disappoint with the Vivo XL, thanks in part to balancing the combination of having a slick design, svelte construction (0.3in/7.5mm), and lightweight figure (5.4oz/152 g). Honestly, it's almost unfathomable to believe 'everything has been crammed in such a thin, compact body. What draws us in the most to the phone's design is the mirrored finish of its rear casing. It's highly reflective and makes for a great mirror for those quick peeks of yourself, while a stitching pattern accentuates the Vivo XL's premium-esque looks. Specifically, BLU refers to the finish as liquid metal, but in reality, it's far from metal – more like a glossy plastic coating that covers everything. Even though it seems like BLU emphasizes on design above everything else, there's still utility in mind – evident in the fact that the _phone_ features a removable battery, dual-SIM slots, and a microSD slot. What's most striking, though, is that a USB Type-C 2.0 port is present on the Vivo XL, ensuring that it's up to snuff with the times. It's a throwback to the AMOLED screens of yesterday; super saturation and a weak brightness output. In complementing its dazzling aesthetics, the 5.5-inch 720 x 1280 Super AMOLED display with Gorilla Glass 3 is absolute in garnering attention with its iridescent glow, over-saturated colors, wide viewing angles, and the typical deep black that AMOLED screens are known for producing. This, from what we can gather, embodies all of the typical characteristics of the technology. While Samsung has perfected the technology, the one used by BLU here harkens back to the AMOLED screens of old. For example, it washes out and fades under direct sun due to its feeble peak luminance of 289 nits. And other qualities about it indicate an inferior screen here, like its colder ~8000K color temperature and over-saturated, unrealistic color reproduction. You know it's representative of AMOLED technology of the past, due to the amount of saturation produced by it – such as in how yellows appear greenish and teal leans on the bluish side. We're checking out the cheaper of the two, the BLU Vivo XL, which chimes in with a devilishly hard-to-resist starting price of $149.00. Visually appealing from head-to-toe, it's undeniably fabulous that its design is a central focus, but let's cross our fingers that other aspects of the phone aren't compromised. 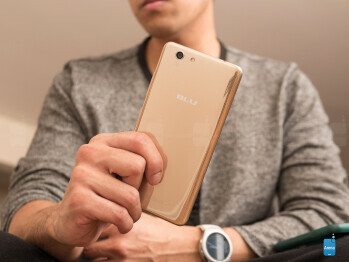 Even though it seems like BLU emphasizes on design above everything else, there's still utility in mind – evident in the fact that the phone features a removable battery, dual-SIM slots, and a microSD slot. What's most striking, though, is that a USB Type-C 2.0 port is present on the Vivo XL, ensuring that it's up to snuff with the times. BLU sprinkles a few notable tricks with its interface, but don't expect it to entice power users. BLU employs its own interpretation of Android here with the Vivo XL, which is currently running on top of Android 5.1 Lollipop. 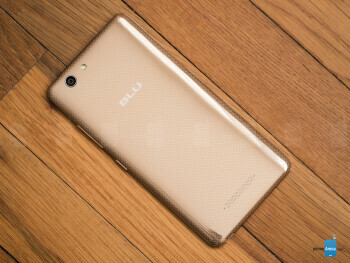 Yes, we're kind of disappointed that it's launching without the latest version of the platform, and unacceptable too at the same time, but it's mentioned as being upgradeable to Android M. Although that might be regarded as a comforting idea, we're curious to see if BLU will follow through with that pledge – knowing fully that the software in its phones rarely sees upgrades. 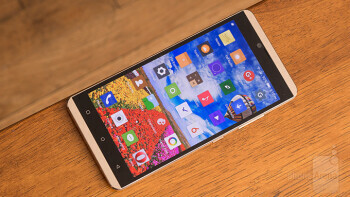 The experience itself follows the implementation used by many Chinese makers, as in eliminating the apps panel entirely and placing everything on the homescreen. Functionally, BLU provides some useful tricks to deepen the experience, like its various smart gestures (double tap to turn on the screen) and “super screen shot” feature. It's not trying to be a mega-Android experience, so the features that are in its arsenal don't come off as overpowering or redundant. 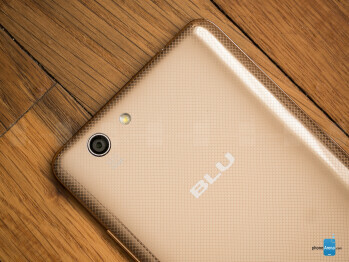 Comparing it to other prized Android experiences, BLU's interpretation is a tepid one at best, combining the core fundamental features of the platform, while sprinkling on a few of its own. Needless to say, it suffices for basic things, but work is still needed to entice power users. Impressively tight with basic tasks, it falls apart over on the gaming front. 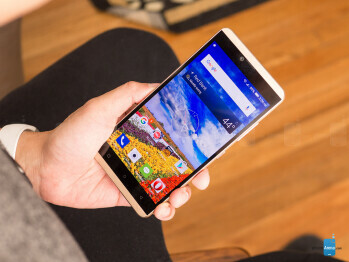 Synthetic tests are one thing, but a phone's real-world performance is another. To that degree, the BLU Vivo XL persists in delivering tight and slick responses with its hardware – an octa-core 1.3GHz MediaTek 6753 processor based on 64-bit architecture, combined with 2GB of RAM and the MALI-T720 GPU. Even with a dynamic wallpaper and a cube-like transition effect on for the homescreen, the handset shows off incredible responsiveness. However, that responsiveness is isolated to basic operations, seeing that it falls apart when it comes to graphics processing. We were hoping for some sort of considerable gain with this hardware combination, but at the end of the day, the phone is riddled with choppiness to the point of being unusable for gaming. Hey, for a sub-$150 smartphone, there's nothing wrong with it being outfitted with 16GB of internal storage – more so when there's expansion available courtesy of its microSD slot. A bleak outlook on this front. On the back, there's a 13-megapixel sensor that features 5-element sapphire blue lenses, f/2.0 aperture, Phase Detection Auto Focus (PDAF), and an LED flash. For the front, it chimes in with a reasonable wide-angle 5-megapixel camera. The focus extends into the interface as well, wherein it's crammed with a ton of shooting modes and a manual one as well. Definitely, there's plenty to tinker around with for casual shutterbugs, especially with how various parameters can be adjusted with the manual mode. BLU wants to paint itself as a serious contender, but the biggest hump it needs to leap over is the lackluster performance from its cameras, which unfortunately, befalls the Vivo XL as well. At most, the camera is able to capture average images when the lighting situations are right, but the results can sometimes be in the subpar range. There's just not enough fine detail, resulting in photos appearing splotchy at times – with noticeably cooler color tones. Things don't get any better under low light, as its quality is accompanied with the typical set of degradations, but made worse because of its inability to focus properly. Turning our attention to its video recording quality, which tops out at 1080p, the BLU Vivo XL also fails to impress in this area with its forgettable qualities. Much like with still image capture, videos just lack a decent level of sharpness and detail to make them attractive to the eyes. Additionally, the lack of continuous focus, the shakiness, and the artifacting elements when panning don't help its cause. Interestingly, there's an anti-shaking setting that attempts to stabilize the footage, but all it does in reality is crop the video and use software tricks to guise its usual shakiness – albeit, the end result still appears a bit artificial. BLU's media gallery works in the same capacity as others, so photos are arranged in a grid-like layout. We do, however, enjoy the expansive editing tools that are at our disposal. While there's generally little bloatware baked in with this, BLU does happen to throw in its own music player. It's not fanciful or ornate by any capacity, but the core functions are intact. The speaker grill on the back of the phone produces a reasonably loud output of 76.3 dB. However, it sounds a bit narrow and thin when the DTS mode is disabled. With it on, though, there's a slight focus on the lower audio ranges, but still lacking substance to keep us attuned. Thankfully, the phone's processing power is effective in playing videos smoothly and without any glitches. Combine that with the iridescent Super AMOLED display, we have no qualms with the overall experience. It even features a useful multi-tasking mode that plays a video in its own, separate window. Even with some minor issues, it's still a relatively okay experience. 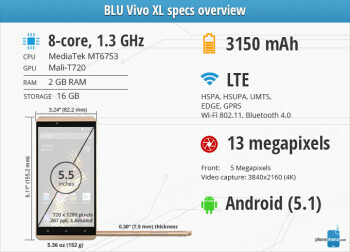 Generally speaking, the BLU Vivo XL is able to handle phone calls. Through the earpiece, voices have good volume and clarity to them. On the other end of the line, however, our callers mention hearing voices that sound a little bit robotic – though, it doesn't make them entirely inaudible. Lastly, the speakerphone produces sufficient volume, but tends to cast a little bit of muffling. All in all, it suffices for the occasion. 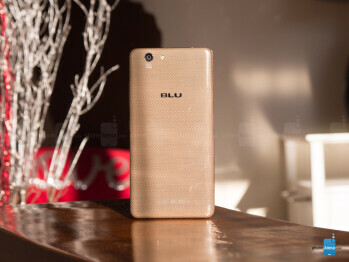 One of the longer-lasting phones from BLU. Just because it has one svelte profile, don't think for a moment that its battery capacity is compromised. Inside, it's carrying an ample sized 3150 mAh battery, and when that's paired with its 720p screen, delivers surprisingly good battery life. By the end of most days, we find it right around the 50% mark, which is magnificent for BLU. Conversely, it manages to put up an on-screen time of 7 hours and 40 minutes in our custom benchmark test. Despite that, it's not one of the faster recharging devices of late, seeing that its USB Type-C connection requires 203 minutes to achieve full charge. A lot can be surmised about a phone under the $150 range, just because most people are inclined to believe that compromises are made in order to reach such a low cost. Well, for starters, the BLU Vivo XL doesn't look like a $150 phone, but rather, one that can easily pass for something $300+. The attention to its design is utterly commendable, and when you add in the fact that it has dual-SIM slots and is unlocked, it definitely increases its value and worth to the consumer. BLU's recipe is once again in full view here with the Vivo XL, a classy looking phone that won't cost you a fortune to own. The savings alone are undeniably savory, but there's still some work to be done in order for it to truly become a benchmark in its class. While there are some noticeable improvements over its previous efforts, like battery life and call quality, it still fails to generate greater success in the camera and software departments. Now, if you're strapped for cash, this makes for a great starter phone – even as a backup to your main one. Just know that it's currently exclusive to Best Buy if you're planning on picking it up, where it's attached with an even more attractive price point of $99.99 for a limited time only!